Tools, and couple other things |Sundews Etc. 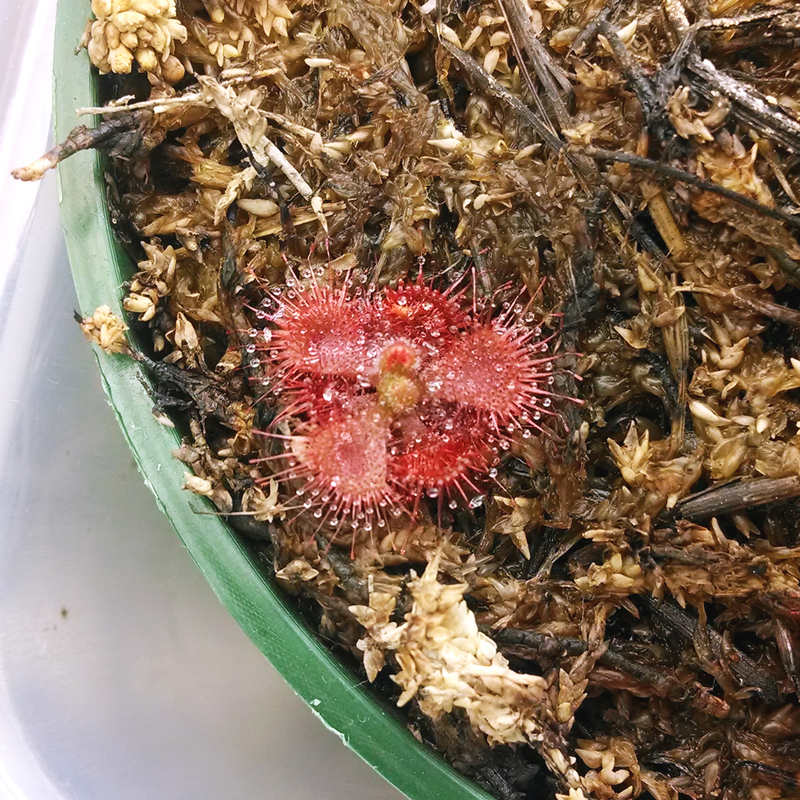 There isn't a whole lot you need to grow sundews. Really, the only 3 crucial elements are nutrient poor soil (peat moss and sand is the most common), very pure water, and lots and lots of light. However, as in every hobby, there are ample opportunities for you to spend your money to make things nicer and nicer. Some of the best investments are in artificial lighting, a timer, and a tray. Having a nice little setup like this takes a lot of the guesswork out of keeping your plants well-watered and well-lit, and is 100% worth the upfront cost. A few of my tools lined up on the table, which is deceptively clean for the blog. 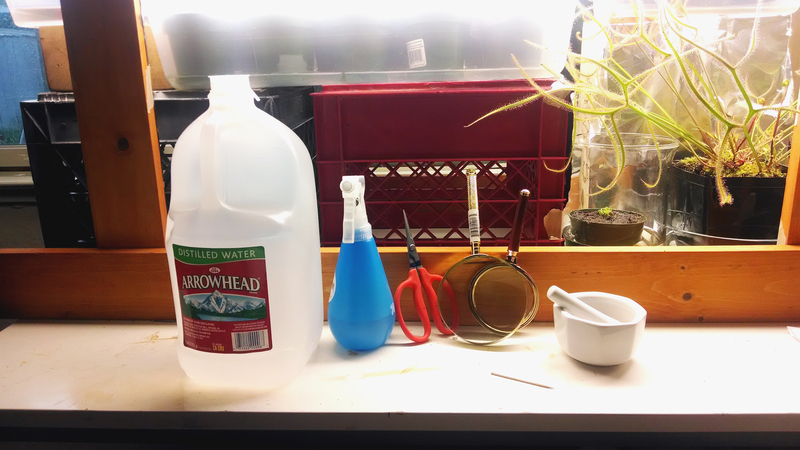 Here are a few of the other things I use in my cultivation. The distilled water, of course, is for the plants. The spray bottle helps keep the tops of some pots moist (especially my D. scorpioides, which were sown on a layer of pure sand), and the trimmers are good for keeping things neat by cutting back old dead growth. The magnifying glasses are both fairly cheap (I need to get myself a decent loupe), but they're nice for looking at the plants more closely. The mortar and pestle is a recent acquisition that I use for grinding up beta fish pellets and things to feed to my plants. The toothpick is my food applicator, which I really need to upgrade. Another note today: my D. capensis typical seedlings, in the pot that I'm planning on using for a window box, have colored up nicely since I last posted about them. Check it out. 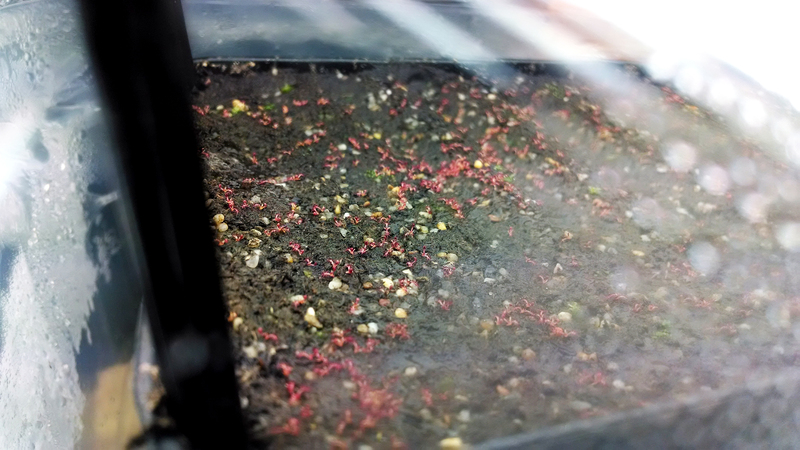 A whole little field of baby Drosera capensis. How cute. Looks like their carnivorous leaves are out! Of course, there's also a decent amount of moss growth in that pot. I'm still experimenting with how much washing of my media I really need to do, and this was definitely one batch that I didn't wash like crazy. Still, I'm sure the sundews will be fine – D. capensis is nothing if not a vigorous grower. I'm going to give it another week or two and then I'll start cutting holes in the humidity tent to start acclimating them to the regular tray conditions, and then I'll be able to start feeding. I started growing carnivorous plants in 2013. I started working at Predatory Plants in 2015. It happened fast. NASC Benefit Auction 2014 is live! Flowers and D. capillaris "Alabama"